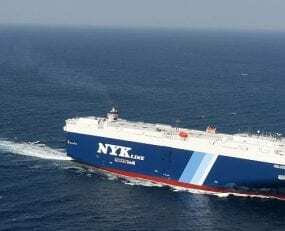 NYK Line has released its financial results for the second quarter of FY 2019. Total revenues decreased 16.9% to ¥* 450.7bn in the second quarter, compared with ¥542.5bn in the second quarter 2018. This has mainly been attributable to lower liftings and utilization in Ocean Network Express (ONE). Operating profit totalled ¥3.9bn, down 57.1% from last year due to underperformance in the Liner and Air Cargo segments. The Liner segment generated a revenue decline of 60.9% year-over-year, from ¥179bn to ¥70bn because of dropped liftings and utilization rates on the Asia-North America and Intra-Asia routes. Also, revenues greatly declined due to the fact that the revenues of ONE, which is accounted for by the equity method, are no longer included. As a result, the segment generated a loss of ¥2.2bn. In the Air Cargo Transportation segment, the company recorded revenue of ¥7.4bn and an operating loss of ¥6.2bn. The loss was primarily driven by improper handling of maintenance work conducted in the past, which caused 11 aircraft to be grounded from the middle of June to beginning of August. The Logistics segment generated revenue of ¥135.3bn, up 6.0% from Q2 2018, particularly due to increased handling volumes in the air freight forwarding business in Japan. Operating profit increased by 46.2% to ¥1.9bn year-over-over mainly due to reduced operational costs and improved productivity. The Bulk Shipping segment recorded revenue growth of 8.3%, from ¥192.2bn to ¥208.1bn in Q3, attributable to higher cargo volumes of iron ore, coal and grain. As a result of improved revenue, operating profit increased by 145.5% year-over-year, from ¥2.2bn to ¥5.4bn.